Jeremy Seysses has an excellent range of 2016s at Domaine Dujac. 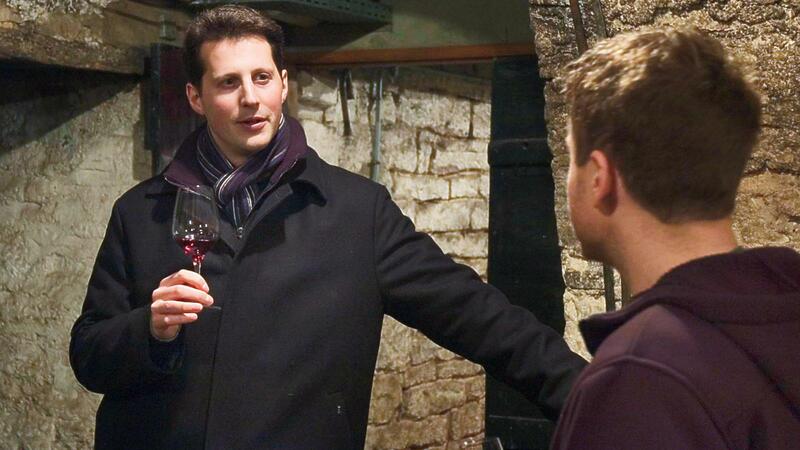 "The 2016s are very poised, everything is in the right place where there was no frost," explained Jeremy Seysses, winemaker and co-owner of Burgundy's Domaine Dujac, as we began tasting through the range of Pinot Noirs. Seysses also noted that in 2016 the harvest was three weeks later than in 2015 due to the late and protracted flowering. Dujac also makes a négociant range called Dujac Fils & Père. These had all been bottled, while the domaine wines were in various stages of bottling. Though the yields were down 20 to 25 percent on average, that doesn't tell the whole story. There are just 6 barrels of the Dujac Fils & Père Chambolle-Musigny 2016. The 2.1 total acres of vines yielded less than 1 ton per acre in 2016; an average year would have yielded triple that. "It was the cuvée most impacted by the frost," says Seysses, adding that of the five parcels, three produced less than 0.4 tons per acre. Needless to say, the wine is concentrated even on the nose, offering black cherry and spice flavors backed by firm tannins. It has outstanding potential, even if a bit rigid at this stage. On the other hand, the Gevrey-Chambertin and Morey-St.-Denis from the Fils & Père line were more together. The former evokes dark tones of black cherry, licorice, tobacco and spice, feeling more relaxed and fluid. The latter reveals ripe bilberry, blueberry, spice and a touch of earth, matched to a fleshy texture. There are also two fine Nuits-St.-Georges premiers crus: a velvety yet fresh Les Damodes and an austere, chalky Les Cras. From the domaine wines, the Domaine Dujac Chambolle-Musigny 2016 was not ready for bottling, featuring pretty floral, cherry and black currant flavors on an elegant frame, while the Morey-St.-Denis with its juniper, bay leaf and black cherry notes and supple texture was bottled two weeks prior to my visit. Morey-St.-Denis Premier Cru comes from four different climats: Les Ruchots, Les Millandes, Les Charrières & Clos Sorbè. Its classy nose revealed black cherry, spice and violet on a refined frame. The Gevrey-Chambertin Aux Combottes boasts ripe, juicy cherry, earth and oak spice, allied to a velvety texture. The Charmes Chambertin is fluid, silky and exudes cherry and raspberry flavors. Dujac's Vosne-Romanée Les Beaux Monts exudes floral, strawberry, currant and spicy flavors, matched to a sleek and delicate profile. "It has the calm serenity of the '16s," says Seysses. Not so the Vosne-Romanée Aux Malconsorts, which is a touch reduced and a darker expression of black currant and violet, showing more concentration, new oak and a tactile sensation on the finish. It will make a fine, classy bottle in time. The Echézeaux (from Champs Traversins), 30 percent below average yield due to frost, exhibits exotic sandalwood and Asian spice with a firm backbone. Clos de la Roche is dense, long, powerful, yet graceful too, delivering black cherry, blackberry, mineral and graphite flavors. Its sibling Clos St.-Denis is more relaxed, yet still very dense and tightly wound, with more red fruit. The Bonnes Mares is normally even split between grapes from the red marl and clay soils and the white limestone soils from Dujac's two parcels, but this year only one-third of the blend comes from the limestone Chambolle side of the grand cru due to the frost. It's lovely, full of red and black cherry, velvety in texture and builds to a long finish. This is an excellent range, however, the lower-yielding cuvées from the frost-hit areas will require more time to fully express themselves.